Cooper Lighting Lumark Crosstour™ Collection Small door wallpack in carbon bronze finish, features die-cast aluminum hinged removable door and back box. This wallpack employs mirrored anodized reflector. 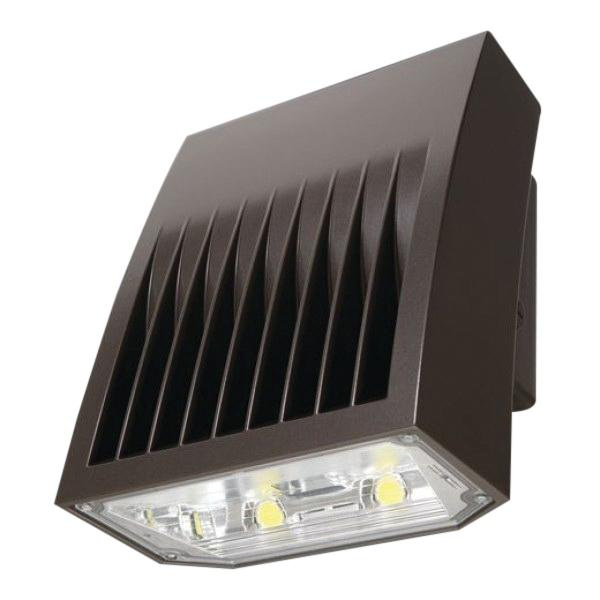 The 18-Watt wallpack has LED lamp to offer 1523-Lumens of natural warm light. This 70-CRI lamp has a color temperature of 3500K. Lamp has voltage rating of 120 - 277-Volt and current rating of 0.15-Amp at 120-Volts, 0.08-Amp at 208-Volts, 0.07-Amp at 240-Volts, 0.06-Amp at 277-Volts. Wallpack with integral LED electronic driver, is wall/surface/inverted/post/bollard mountable. It measures 6-3/4-Inch x 5-3/4-Inch x 3-5/8-Inch. This IP66 rated wallpack withstands ambient temperature rating of 40 deg C. It is suitable for use in building entrances, multi-use facilities, apartment buildings, institutions, schools, stairways and loading docks test. It includes 120-Volt photocontrol. Wallpack is UL/cUL listed, NOM certified and RoHS compliant.